Background The optimal timing and duration of immunosuppressive therapy for idiopathic membranous nephropathy (iMN) have been debated. This study aimed to evaluate whether measuring the antibody against the phospholipase A2 receptor (PLA2R-ab) at start and end of therapy predicts long-term outcome and therefore may inform this debate. Design, setting, participants, & measurements This observational study included all consecutive high-risk patients with progressive iMN observed from 1997 to 2005 and treated with oral cyclophosphamide (CP) or mycophenolate mofetil (MMF) in combination with corticosteroids for 12 months. Patients were prospectively followed, and outcome was ascertained up to 5 years after completion of immunosuppressive therapy. Serum samples were collected before and after completion of therapy. PLA2R antibodies were determined retrospectively in stored samples using ELISA. Results In total, 48 patients (37 men) were included. The median age was 55 years (range, 34–75), and the median serum creatinine level was 1.60 mg/dl (range, 0.98–3.37 mg/dl). Twenty-two patients received MMF and 26 received CP. At baseline, PLA2R-abs were present in 34 patients (71%). Baseline characteristics and outcome did not significantly differ between patients negative or positive for PLA2R-ab. In PLA2R-ab–positive patients, treatment resulted in a rapid decrease of antibodies: median anti–PLA2R-ab, 428 U/ml (range, 41–16,260 U/ml) at baseline and 24 U/ml (range, 0–505 U/ml) after 2 months. The PLA2R-ab levels at baseline did not predict initial response, but antibody status at end of therapy predicted long-term outcome: After 5 years, 14 of 24 (58%) antibody-negative patients were in persistent remission compared with 0 of 9 (0%) antibody-positive patients (P=0.003). Conclusions These data suggest that in PLA2R-ab–positive patients, measuring PLA2R-abs at the end of therapy predicts the subsequent course. Idiopathic membranous nephropathy (iMN) is an important cause of nephrotic syndrome in adults. Spontaneous remissions do occur, but many patients will need treatment with immunosuppressive agents (1,2). The optimal modality, timing, and duration of immunosuppressive therapy are still debated (3–5). The most recent Kidney Disease Improving Global Outcomes guideline recommends initial therapy with 6 months of cyclical steroids and cyclophosphamide (CP) in high-risk patients, defined as patients with persistent nephrotic syndrome (>6 months), deteriorating renal function during the first 6–12 months after diagnosis, or severe symptoms related to nephrotic syndrome (6). The available trials included different patient groups and variable durations of therapy with alkylating agents over 6–12 months (7–10). Current therapy is not individualized according to disease severity or disease activity parameters during treatment. A complicating factor is the slow response; remissions can occur 12–18 months after completion of the treatment regimen (6). Therefore, the guidelines advise managing all patients conservatively for at least 6 months after completion of immunosuppressive therapy. The difficulties are illustrated by a study with mycophenolate mofetil (MMF): the initial response was similar to that seen with cyclophosphamide; however, early relapses occurred after withdrawal of MMF whereas proteinuria decreased further after cessation of cyclophosphamide (11). The recently discovered antibody against the phospholipase A2 receptor (PLA2R-ab) has enhanced research in iMN (12). PLA2R-abs are present in about 70% of patients with iMN (13). A weak but significant association between antibody levels and proteinuria has been described (14,15). Moreover, antibody levels at presentation may help to predict outcome because patients with the highest antibody levels were less likely to develop a spontaneous remission of proteinuria (14). Two recent studies that evaluated the effects of rituximab showed that antibody levels decreased during therapy and preceded the reduction of proteinuria (16,17). The aim of this study was to determine whether the measurement of PLA2R-ab at start and end of therapy is useful in predicting the outcome after immunosuppressive therapy. We included adult patients who were treated with immunosuppressive therapy for biopsy-proven iMN between 1997 and 2005. Secondary causes were ruled out per standard policy, as described elsewhere (18). Standard of care in our center consisted of a restrictive treatment strategy, as recently described (2). Patients with a serum creatinine concentration >1.5 mg/dl or with severe nephrotic syndrome were advised to start treatment with oral CP, 1.5 mg/kg daily for 12 months, which was our standard treatment regimen at that time (8). From 2002 to 2005, eligible patients were treated with oral mycophenolate mofetil (MMF), 1000 mg twice daily for 12 months (11). Both agents were given in combination with corticosteroids, as described elsewhere (11). Of note, the criteria to start immunosuppressive treatment were exactly the same in all time periods. The study was conducted in accordance with the guidelines of the Declaration of Helsinki and was approved by the local ethical committee. All participants gave written informed consent. Patient data were prospectively collected. We previously reported the time course of proteinuria in patients treated with cyclophosphamide (19). A similar study protocol was used in patients treated with MMF (11). In brief, participating patients were seen at the outpatient clinic for a standardized evaluation. Urine and serum samples were collected and stored at −80°C. Samples were collected at the start and the end of therapy. In addition, in some patients samples were collected at 2 and 6 months after start of therapy. For the present study, we retrieved all available serum samples. After thawing, PLA2R-abs were determined with an in-house ELISA (20). The ELISA has been described before in detail (20). The intra- and interassay coefficients of variation are <8% and 17.8%, respectively (20). All samples were assayed within the same batch experiment. A sample was considered positive if the PLA2R-ab titer was >40 U/ml. Samples that were off-scale (>3000 U/ml) were remeasured in higher dilution to define correct titers. Up to two additional freeze/thaw cycles did not affect anti-PLA2R binding, as measured by our ELISA (data not shown). Patients were followed for up to 5 years after completion of immunosuppressive therapy. Complete remission was defined as proteinuria<0.2 g/d with stable kidney function, and partial remission was defined by proteinuria<3.5 g/d with a reduction of >50% from baseline and stable kidney function (21). Achieving remission includes both partial and complete remission. A relapse was defined as proteinuria>3.5 g/d and an increase of >50% compared with the lowest value during remission. Follow-up time was calculated from end of therapy until the occurrence of an event (defined as relapse, death, or start of additional immunosuppressive therapy) or 60 months in case no events occurred (sustained remission or ongoing proteinuria). Follow-up of 0 reflects relapse during treatment (after induced remission). For assessment of proteinuria, we used the mean value of two 24-hour urine samples. To adjust for sampling errors, proteinuria is corrected for creatinine excretion. All analyses were performed using SPSS software, version 20.0 (IBM, Chicago, IL). Medians with ranges were calculated for skewed variables. For comparison between groups, we used the Mann–Whitney U test. Distributions between groups are described by the chi-squared test. Outcome data were analyzed with Cox regression analysis. The cumulative probability of a clinical event was estimated according to Kaplan–Meier analysis and evaluated using a log-rank test. In this analysis, persisted proteinuria during follow-up was scored as an event at T=0. P<0.05 was considered to represent a statistically significant difference. In total, 48 patients were included, of whom 22 received MMF and 26 received CP. At baseline, PLA2R-abs were present in 34 (71%) of these patients. The baseline characteristics are shown in Table 1. 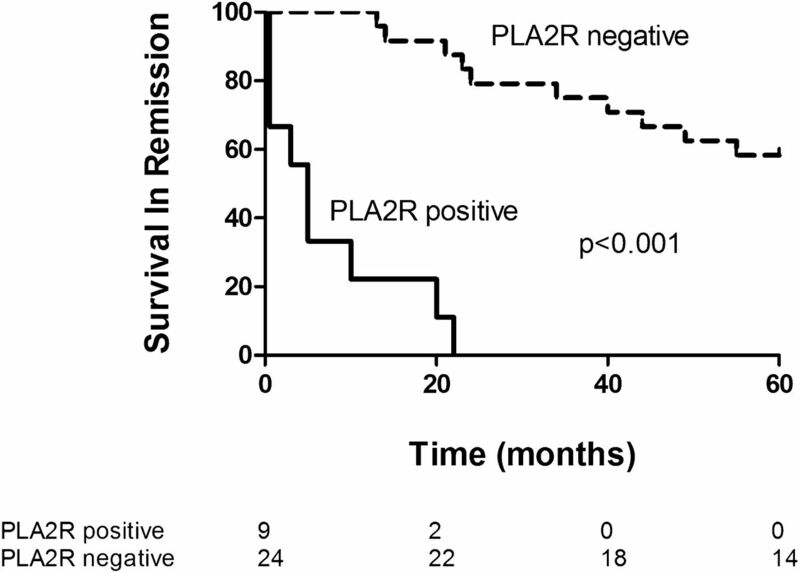 Patients with PLA2R-related disease did not differ from patients with negative PLA2R-abs. Nine patients were included with a recurrent episode at baseline; 4 of these had previously received immunosuppressive therapy (CP in combination with prednisone) 39–84 months before start of the present therapy. Response to therapy was similar in both groups: Persistent remission occurred in 7 of 14 PLA2R-ab–negative patients and in 14 of 34 PLA2R-ab–positive patients (Table 1). Overall characteristics of 33 patients positive for PLA2R-ab are shown in Supplemental Table 1. One patient was excluded from these subanalyses because of lack of PLA2R level at end of therapy. In the 33 patients positive for PLA2R-abs, median proteinuria decreased significantly after start of therapy; 25 patients (76%) developed a (partial) remission 12 months after start of therapy. The PLA2R-ab levels at start of therapy did not predict the initial response or the final outcome (Supplemental Table 2). During follow-up as long as 5 years after withdrawal of therapy, 6 patients developed and maintained a complete remission, 8 patients remained in partial remission, 12 patients relapsed, 4 patients had persistent proteinuria (resulting in additional immunosuppressive therapy in 3), and 3 patients died. At the end of treatment, 24 patients had become negative for PLA2R-abs and 9 were still positive (Figure 1). Antibody status at end of therapy was related to the clinical status: A (partial) remission at 12 months was observed in 3 of 9 PLA2R-ab–positive patients and in 22 of 24 PLA2R-ab–negative patients (P=0.003). Most important, antibody status at the end of therapy predicted the long-term outcome (Table 2 and Figure 2). None of the patients positive for antibodies at the end of therapy developed persistent remission. 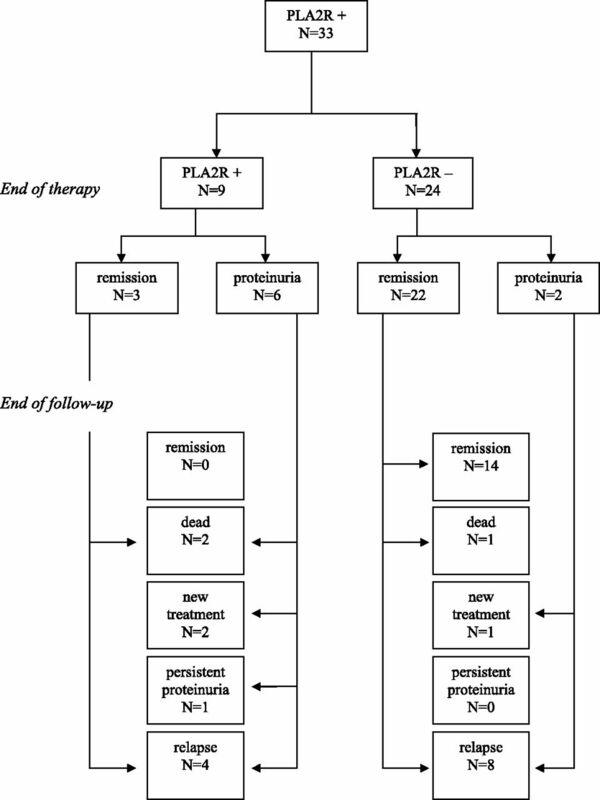 Flow chart of phospholipase A2 receptor (PLA2R) antibody–positive patients with idiopathic membranous nephropathy and outcome through up to 5 years of follow-up. Kaplan–Meier plot for survival in remission, grouped by PLA2R antibody status at end of therapy. Numbers of patients at each time point are given below the figure. Log-rank test chi-square=37.05; P<0.001. In a subset of patients with PLA2R-related disease, PLA2R-abs were measured during therapy (Table 3). Antibody titers did not significantly differ at start of therapy between patients treated with CP (median titer, 477 U/ml [range, 41–2150 U/ml]) and patients treated with MMF (median titer, 253 U/ml [range, 62–16,260 U/ml]). Both MMF and CP resulted in a rapid decrease of antibodies. CP was more effective in decreasing antibodies at 2 months (PLA2R-ab negativity in 11 of 13 patients treated with CP and in 4 of 9 patients treated with MMF; P=0.05). At the end of therapy, significantly more patients treated with CP were PLA2R-ab negative (16 of 18 for CP versus 8 of 15 for MMF; P=0.02). In both the MMF group and the CP group, one patient became antibody negative early in the treatment course and became positive again at 12 months. Both these patients presented with an early relapse during withdrawal of therapy. Over time, most patients who became negative for antibodies developed remission, although some lag time was observed (Figure 3). Long-term outcome in patients who became PLA2R-ab negative was independent of the type of immunosuppressive agent used (Supplemental Table 3). Clinical and immunological remission in time. Percentage remissions in patients in whom PLA2R antibody had disappeared. Our data suggest that measurement of PLA2R-abs at the end of immunosuppressive therapy in PLA2R-ab–positive patients predicts the subsequent course during prolonged follow-up. Most patients in whom PLA2R-abs had disappeared remained in remission. In contrast, no long-term remission was seen in patients with persisting positive antibodies. Beck et al. (16) were the first to show that a reduction or disappearance of antibodies after treatment with rituximab was associated with clinical response to therapy. This study confirms and extends their findings by evaluating the predictive value of measuring PLA2R-ab levels at the end of therapy with regard to long-term clinical outcome. Our study is small, and the conclusion should therefore be regarded with caution. Our findings are in line with the general hypothesis that the immunologic response precedes, is linked to, and may modulate the clinical response. This concept is based on a few studies in which serial antibody levels have been measured in patients with PLA2R-related iMN (15–17,22). We previously showed that 12 of 13 patients became PLA2R-ab negative during a remission and positive again during a relapse (15). Oh et al. measured serial PLA2R-abs in a subset of 6 patients: In 3 of 4 patients with remission, antibodies had disappeared, whereas antibodies remained positive in the 2 patients without a remission (22). Beck et al. studied 25 patients who received rituximab (16). After 12 months, PLA2R-abs had disappeared in 17 patients. At that time, a remission was observed in only 10 patients. Of note, 6 of the 7 patients without remission at 12 months developed a remission before 24 months. In 6 patients PLA2R-abs were persistently present at 12 months. Two of them developed a partial remission at 24 months. Hoxha et al. analyzed serial antibodies in 5 patients treated with rituximab as well. 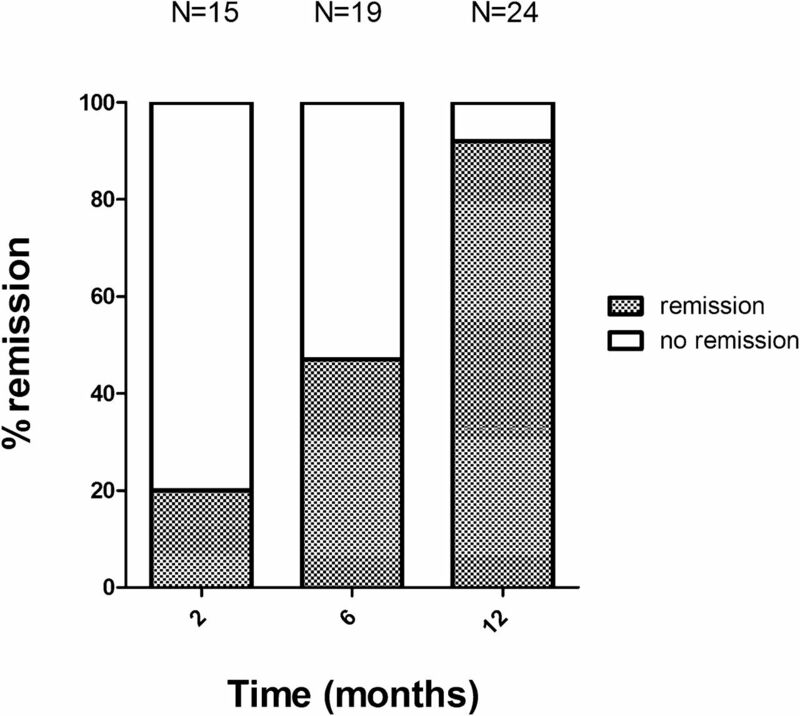 PLA2R-ab levels decreased in 3 patients achieving partial remission after 12–18 months (17). Overall, the disappearance of antibodies predicted good outcome independent of the type of immunosuppressive agent used. This study also suggests that antibodies disappeared more often in patients treated with CP than in patients treated with MMF. These observations are compatible with previously reported study results: MMF induced clinical remission in iMN, but there were more patients with a primary nonresponse and more patients with a relapse soon after the end of therapy (11). Obviously, our data do not provide formal proof that proteinuria response at the end of therapy is less accurate in predicting long-term outcome. Larger studies are needed to allow comparisons. Still, taken together, some evidence suggests that patients who have not developed a remission at the end of therapy and are still PLA2R-ab positive will not develop a complete remission during follow-up. Moreover, antibody levels decreasing during therapy preceded the reduction of proteinuria, as was found in two earlier studies (16,17). Determination of antibodies during therapy could therefore be of additional value in predicting response to therapy at an earlier stage. In our study, neither the presence of PLA2R-abs nor the level of the antibodies at baseline predicted the response to therapy. Of note, there is a selection bias because our study included only patients with progressive disease. Two studies that evaluated all incident patients with iMN found no differences in spontaneous remission rate and overall outcome between patients with and without PLA2R-abs (14,22). These observations suggest that PLA2R-ab–negative patients have a clinically similar disease, most likely with different autoantibodies and autoantigens. The study by Qin et al. seems an exception (23). These authors studied 60 Chinese patients with iMN. With the standard Western blot technique, PLA2R-abs were detected in 49 patients (82%). The PLA2R-ab–negative patients were more likely to develop a remission. However, interpretation of the results is difficult because in 10 of the initially 11 PLA2R-ab–negative patients antibodies were indeed identified with a more sensitive assay, suggesting that these were lower titers associated with good outcome. In this respect, Qin and colleagues’ study is in line with other studies that observed an association between PLA2R-ab titer and outcome (14,20,22). In the study by Hofstra et al., patients with iMN in the highest tertile of PLA2R-ab had the lowest likelihood of developing a spontaneous remission (4% versus 38%). In the study by Oh et al., the role of antibody titer was disputed (14). However, in this analysis patients without PLA2R-abs were included, which invalidates the conclusions. Limiting the analysis to PLA2R-ab–positive patients, spontaneous remission occurred in 45% of patients with low antibody titers and in 15% of patients with high antibody titers. Patients with high antibody levels were also more likely to progress to renal failure in Kanigcherla and colleagues’ study (20). Admittedly, the latter study can be criticized because it was cross-sectional, in which prevalent patients and patients in remission were included in the comparison. The main limitations of the current study are the small size, the missing samples at 2 and 6 months, and the heterogeneity of the patients. However, although our study includes both incident patients and patients with relapsing disease, all patients experienced a new episode of nephrotic syndrome at inclusion and had not received immunosuppressive therapy for this episode. Moreover, our study includes a specific high-risk cohort of patients, all treated with immunosuppressive therapy. The value of persistent antibodies in untreated patients is unknown. Our conclusions therefore mainly apply to patients who received immunosuppressive treatment. The results should be confirmed in larger datasets and in different subsets of patients. If our findings are reproduced, then measurement of PLA2R-abs may allow individualized therapy, a strategy that is potentially safer and more cost-effective than current practice. Finally, our conclusions are based on quantitative evaluation of PLA2R-ab using ELISA. Although in general there is good agreement between ELISA and the immunofluorescence test, some discrepancies do occur (14). We re-evaluated 11 available serum samples of patients negative for anti–PLA2R-ab in ELISA and observed a positive result on immunofluorescence test in three patients. These findings clearly underline the need for calibration of the evaluation assays. We suggest that a test for anti–PLA2R-abs should be ordered in all patients with biopsy-proven membranous nephropathy. A positive test result confirms the diagnosis of primary (idiopathic) membranous nephropathy with high specificity. A negative test result does not exclude the diagnosis of iMN (because approximately 30% of patients with iMN have no antibodies); still, in such a patient, secondary causes should be excluded. Of note, it was suggested that in some patients with anti–PLA2R-related MN antibodies in serum may not be measurable. In such patients, assessment of the PLA2R antigen in kidney biopsy specimens may be of value to disclose PLA2R-related disease (24). Although levels of antibodies might have predictive value (high titers indicating a low likelihood of spontaneous remission), we do not advocate routine measurement of PLA2R-ab levels at this moment because the various tests (Western blot, immunofluorescence test, and ELISA) have not been calibrated. In patients positive for antibodies, we propose repeating the assay at regular intervals during follow-up. In untreated patients, disappearance of the antibodies will forecast the development of spontaneous remission. In patients receiving immunosuppressive therapy, knowledge of the time course of antibody levels should allow tailored treatment (i.e., stopping immunosuppressive therapy if PLA2R-abs have disappeared or changing immunosuppressive therapy if PLA2R-abs persist). Obviously, prospective studies are needed to validate this proposal. In conclusion, disappearance of PLA2R-abs during immunosuppressive treatment predicts a good long-term outcome, whereas persistent PLA2R-abs are associated with a low chance of persistent remission during follow-up. We suggest that studies should evaluate antibody-guided therapy: stopping CP as soon as the patient becomes antibody negative and adding additional therapy (i.e., rituximab) when antibody positivity persists after 6 months of treatment. J.M.H. is supported by a grant from the Dutch Kidney Foundation (KJPB.11.021). Part of the data were presented at the American of Society of Nephrology Kidney Week 2013 (FR-OR049). This article contains supplemental material online at http://cjasn.asnjournals.org/lookup/suppl/doi:10.2215/CJN.10471013/-/DCSupplemental. See related editorial, “Antiphospholipase A2 Receptor Autoantibody Guided Diagnosis and Treatment of Membranous Nephropathy: A New Personalized Medical Approach,” on pages 1341–1343.